One of the things you need to remember is that your sharpness comes from the flash of the studio light and your shutter speed lets you worry about how much ambient light to allow into the scene. I typically start at my ISO 200 (for my D700) 1/125th & f/8 and then adjust from there. 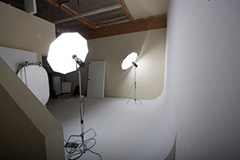 Sometimes, you may want to blend ambient light with your studio light. Since the sharpness comes from the flash, you can drop the shutter speed quite a bit to let the ambient light to creep in and make the scene. For example, I shot this at ISO 200, F/8 and 1/8 second hand-held. One thing I’ve been trying to do this year is “Pay it Forward”. Giving back to the community by doing free portrait sessions for the people that give every day like the local church & Fire Brigade. And giving back to the photography community by trying to give as much information as I can about a personal project I’ve taken on for 2010. I’ve doing one Self Portrait a week for a year – nothing out of the ordinary there, lots of people do this, some do it every day for the whole year! What I’m trying to do is show a larger part of the process though. By providing the lighting diagrams of (almost) every shot and showing the contact sheets from the shoot itself (because I know I don’t just rock up and get the picture the first time), I’m hoping to give and inspire the community that inspired me in the first place to expand my photography. I have learned some amazing techniques from Zack Arias. 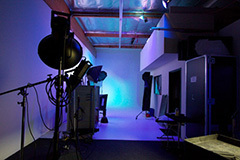 His One Light Workshop seminars / DVD’s are incredible and definitely worth their price. In a nutshell, put your camera into full manual mode, set your shutter speed to your flash sync speed. Use your aperture to control the exposure settings (only adjust your power settings on your flash if you need to specify a specific aperture). Adjust your shutter speed to allow additional (or less) ambient light into the equation. Check out his sight (or Flickr group) for some great shots using this method. I can’t say enough good things about Don Giannatti’s blog, Lighting Essentials. I would also highly recommend his Learn to Light workshops… Of all the money I’ve spent on this hobby, the $450 I spent on that workshop was the best money I’ve spent so far. Yep, Zach Arias is the man. I can’t recommend his DVDs enough! A general stylistic tip: Check Flickr, especially the Strobist group, and other sources. Make note of what lighting styles are currently popular. Then don’t use them. You don’t want to disappear in an ocean of images all in the same lighting style of the week. Pro photographer from Chennai, India. Nice to see you jump into the wonderful world of studio and lighting. I will thridly suggest Dave Hobby from the strobist blog and Don Giannatti (Wiz WOW) of lighting essentials Both can get beginneers going and keep pros learning. Any material by Chris Grey is a great resource. Here is a list of Chris Grey articles on ProPhotoResource which is in itself, a veritable treasure trove of lighting/studio resource. I do a lot of portraits in my small studio, and try to document them with diagrams and all, as often and accurate as I can. At first I did it to learn what works and not, but later on, to share with others. My studio lighting setup diagrams can be found on my blog, together with examples and a lot of text trying to explain what I wanted to achieve. This might be shameless self-promotion, but I post it anyway, hope you will find it helpful. Here’s one on “dramatic lighting”. If you have the time and $25.00 (or $19.95 if you’re a member of NPPA) you can sign up for one month of Kelby Training videos. Watch the videos by Joe McNally (it’s amazing what he can do with speedlights. Dude uses iTTL and Nikon CLS and adjusts exposure accordingly with compensation) and David Ziser. I learned so much from those two. Several people have mentioned Zack Arias. I had the pleasure of somebody giving me their One-Light DVD they bought from him and I couldn’t believe how simple much of the lighting setups are. Good luck and I look forward to hearing how it went! Pretty soon you’ll find the big strobe lighting stuff is just another tool in the toolbelt, something else to use when needed. Here is another good source i found.